"For the first time... the vast, spectacular drama that changed the world!" 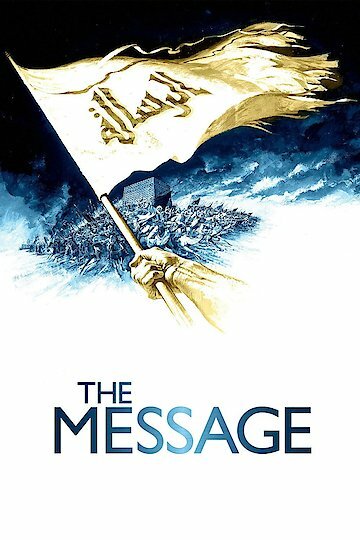 The Message is a movie about the birth of the Islamic faith during Mohammed's time. The film is directed and produced by Moustapha Akkad. Most of the filming was done in Libya, and Morocco. Anthony Quinn plays Hamza, a warrior who helps his nephew Mohammed. During the seventh century Mohammed has a vision. Gabriel, an Angel of the Lord, visits Mohammed in his sleep. Gabriel urges Mohammed to turn his people back to God, and to turn away from idol worshiping. The people pray to over 300 idols of Kaaba instead of to God. Political, and military corruptness in the city of Mecca is rampant. Mohammed, with the help of his uncle Hamza, sets out to liberate the city of Mecca and return it to God. The Muslims have to leave Mecca because they are persecuted for what they believe. They go to Medina, but after several historical battles, they return triumphantly to Mecca. Two major battles are depicted, and they are the battles of Badr and Uhud. These battle scenes are pretty violent considering the times they were filmed. For the most part the story is told from individuals' points of view. Hamza, and Abu Sufyan, the leader of Mecca, are two characters that relate the story. Abu Sufyan's wife, Hind bint Utbah, reflects on some of the events that occur. Both Abu Sufyan, and Hind bint Utbah are enemies of Islam in the beginning. They eventually become converts to the Muslim faith. One will never see Mohammed because it is forbidden in the Muslim faith to depict him in any way. The movie is almost three hours long and considered PG. The rating would probably be PG-13 now due to the amount of violence. There are some torture scenes, but they don't actually show a woman being drawn and quartered. There are several scenes where people are brutally killed, and some of the gore is left to the imagination as a man is crushed to death. The battles are violent and there is killing galore. The Message is currently available to watch and stream, download, buy on demand at FlixFling, FlixFling VOD, iTunes online.